It's a very quick one from me tonight as we have just finished our last kid's school holidays workshop at the warehouse and I have barely enough energy to lift my cup of coping cordial to my lips let alone try and kick start my old brain into gear to write anything that is even remotely intelligible or interesting to read. It's been quiet on the blog these past two weeks, because like most of you guys I have been busy kid wrangling through the school holidays, juggling work and housework and just generally trying to make sure my children were busy enough that they didn't feel the need to use each other as punching bags or target practise. School holidays do me in every single time, but I also know that very soon those kids of ours will be grown up and they will no longer drive me batty vying for my attention and that makes me feel more than a little sad and so I intend on soaking as much of the craziness as I can... whilst I can. The reality is - it doesn't last forever, and whilst there is a part of me that is mighty relieved about that fact, there is a bigger part of me that is already mourning the loss of their neediness. On an entirely different note, we are THIS close to Sam's book being finished and I cannot wait to share the full story with you guys and the book itself. 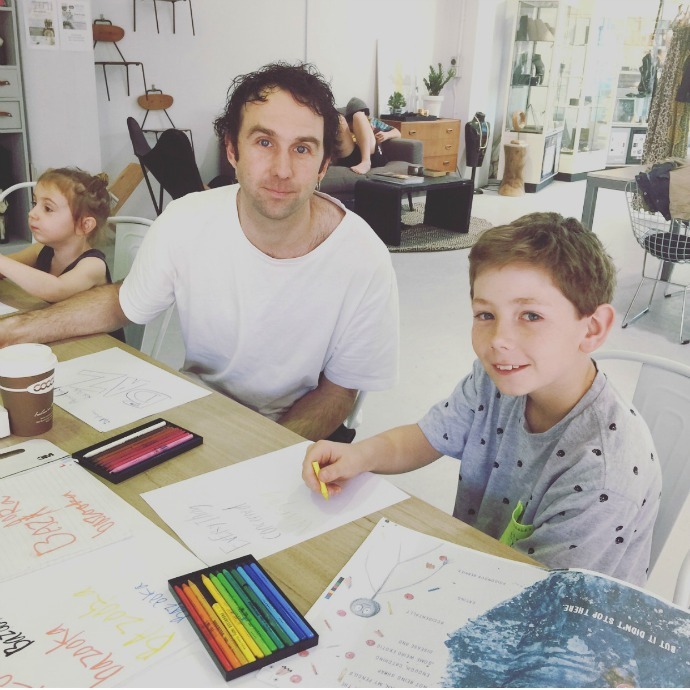 It has been a two year process but today Sam met with his illustrator Fiona Kate and his graphic artist Steve Leeder from Little Paper Lane and together they nutted out the final layout of the book and added the last of the personal touches illustration wise from Sam. I can't tell you just how proud I am of this little guy. Just watching his joy today as he realised that this is really happening and the pride in his face when the whole creative team came together to meet him to get his approval on the layout.. well it made my own pride bubble over to the point that I practically exploded mum gushiness all over everyone in the room. Puffed up like a peacock I was, and that is a major understatement. 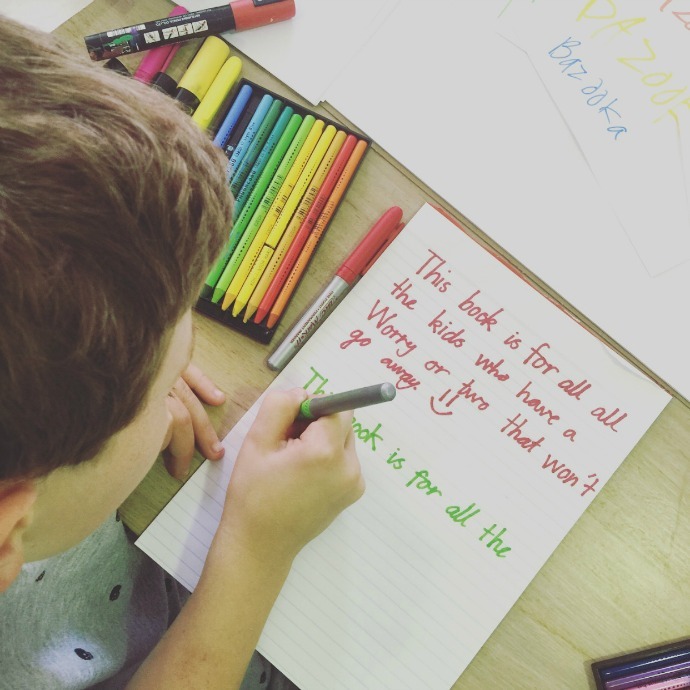 He wrote his book's dedication today - "This book is for all the kids who have had a worry or two that won't go away". You nailed it Sammy boy. NAILED it! We have all had worries that just won't go away and I hope you realise that it is not just this book of yours that will help other kids deal with their anxiety, you yourself will help people as you are a living testament to what we can overcome in life and I have no doubt that you will inspire both kids and adults to find the courage to face our own fears... and that my boy is such a gift you are putting out to the universe. YOU are a gift my little man. It's such an awesome thing to see your children happy isn't it? Especially when you know what a struggle they have been through to get to that point. Big steps for such a little guy. Anyway, enough of my gushiness today, you guys are here to get your party on so let's get linking yeah?! There is no guest hostie today because, ahh school holidays, but as per usual to play along simply link up your favourite post from the past week and then if you get a chance, pop around and say hello to some of the other lovely linkers. The Weekend Rewind blog hopping party starts every Friday night at 8pm and links will close on Sunday night at midnight. Link up here or over on Bron's blog (Maxabella Loves) or Zoe's blog (A Quirky Bird). It does not matter where you link as your link will show up in all 4 places.